Whether you were born here, or chose this place as your home, you make Oregon what it is today – and you can play a part in a brighter tomorrow. BEF has joined #OregoniansGive, where bringing together people from every city, town, and rural community, in a statewide #GivingTuesday celebration of what it means to be Oregonian. 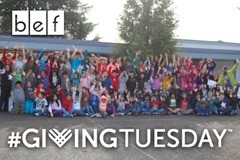 Beaverton Education Foundation is thankful for so much and is grateful to the community it supports. For twenty-seven years, BEF’s teacher-designed grant programs innovate and inspire students. As we kick off the giving season, BEF is joining the national #Giving Tuesday movement, with a local twist – #OregoniansGive, inspiring personal philanthropy and encourages both giving and giving back. On Tuesday, December 1, 2015, charities, businesses, students, community centers and families around the world to come together for one common purpose: to embrace generosity and to give. BEF’s #GivingTuesday is a continued invitation to give back to our students. An opportunity to help raise funds for hands-on innovative academic enrichment and advanced programs and projects that go beyond normal school funding at all 51 Beaverton public schools. By giving to BEF, grants are made possible to fund classroom, summer and after-school programs not mandated or funded by the state, but ones our parents and dedicated educators consider necessary for a quality education. Each year the Foundation funds a wide range of grants all designed to give kids the opportunity to shine and propel them to future success. Join us in being a part of this tradition of generosity and opportunity for our students. With your help, BEF will continue to provide students the grounds for success that make them better citizens and leaders of today, as well as, tomorrow.